Sort your games and homebrews. Delete, cut, copy, rename, create, view properties of file/folder, set them hidden/read-only. View and edit with hex editor. View loaded threads, modules, files. 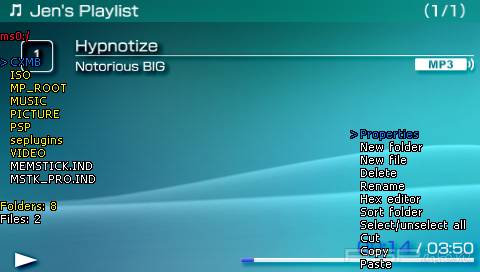 And all that you can do from XMB menu when you are listening music or watching videos. Added alarm clock, alarm sound must be in "ms0:/seplugins/PSPconsole/alarm.mp3". Fixed some hex editor bug. Added feature to disable PSPconsole when PSP keyboard (OSK) is running. Added fast movement when writing text. Added feature to see if there is files/folders up/down in file explorer. Fixed some bugs in text viewer. Fixed bug when reseting options. Fixed bug when reseting file option hidden/read-only. Added option PSPconsole button, now default PSPconsole button is START. Removed VSH menu options because now you can use other button and use VSHmenu on SELECT button. Removed time from top bar, I think it was useless, and added battery temperature. Added feature to load homebrew from "ms0:/PSP/GAME/HOMEBREW/EBOOT.PBP". Added feature to load *.pbp and *.prx in file explorer. Fixed bug when minimizing calculator. Fixed bug when renaming file/folder name was too long. Fixed bug when saving file option hidden/read-only. Added lots of new options. Added file explorer sorting by name. Added sorter for any directory in file explorer for thouse who uses game category plugin. Added fast scroll in game sorter. Improved calculator with lots of new functions. Added fast scroll in file explorer. Added high score in C snake. Added feature to quickly see battery info. Added feature to rename, create file/folder. Added feature to view text files.